Prettiest chocolates you’ve ever seen. Seriously! Don’t you just want to sit and stare at them all day? What a lovely, special gift. And too beautiful to eat. Couldn’t possibly. Must exert willpower…Ooo, dulce de leche would be divine…maybe just one…mmm, need to try the crème brûlée…and the key lime…whoops. 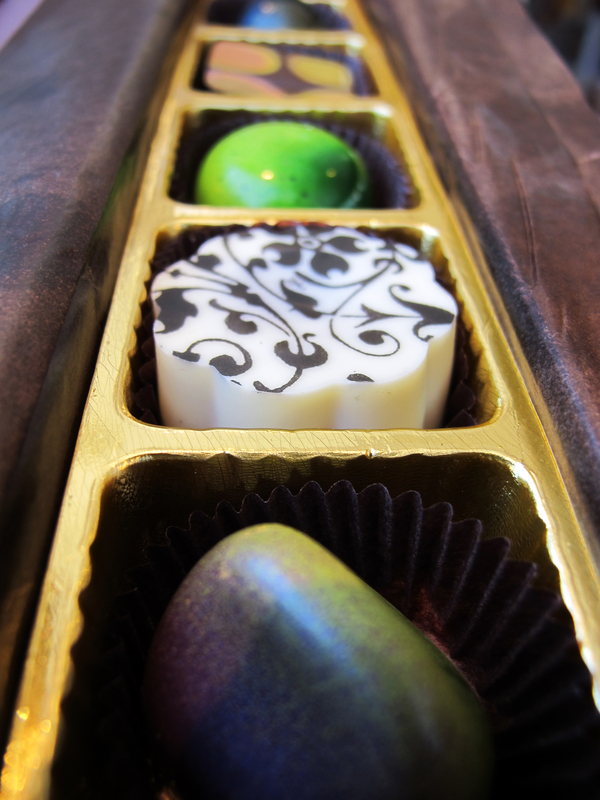 Hand made artisan chocolates. Apt description. Utterly mesmerized by their flavour guide (complete w. pictures! ): salted caramel, pistachio, lemongrass, cappuccino, grand marnier, pear & ginger, biscotti, grapefruit & tarragon, macadamia caramel… shall I keep going? And may I too, be a chief chocolate officer (CCO) like William Dean Brown (best business card ever). Open up shop in Toronto…pretty pls.